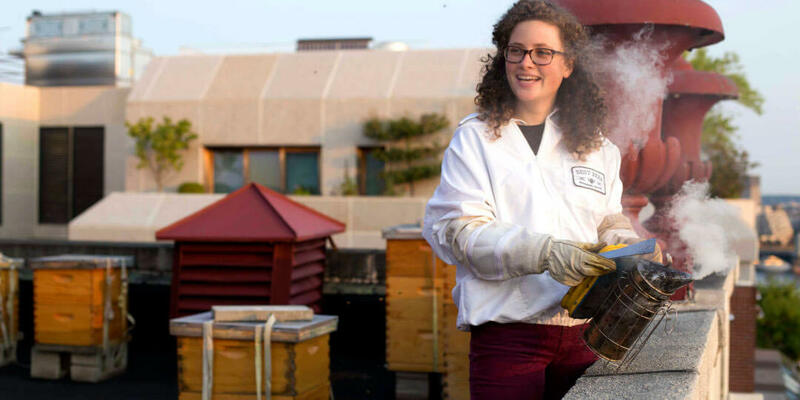 Sophie Chaney is a three year veteran beekeeper and regional field advisor at our Boston headquarters. In addition to her work at Best Bees, she has also contributed to pollinator research in South Africa under the South Africa National Biodiversity Institute. Position/title: Regional field advisor / special ops beekeeper. I specialize in problem solving for troubled hives missing queens or struggling with disease. What is your favorite part of beekeeping? I love how the bees respond to my energy. It keeps me from letting my mood or stress take over, and has a way of keeping me present and in tune with the bees and my natural environment. What is your least favorite part of beekeeping? Sometimes when a queen is no longer able to support the colony because she is not laying eggs well or is diseased, I have to “end the life” of the old queen before introducing a new one. This informs her workers of her passing via pheromones and allows for more successful acceptance of a new, healthy queen. The bees respond dramatically to the death of their queen and it breaks my heart a little bit each time. However, there’s something to be said for the feeling of accomplishment when a colony’s health turns around after the introduction of a new queen! How did you get into beekeeping (pre/post starting work at BBC)? I was studying biology at Northeastern University and happened upon the opportunity to work with Best Bees as a co-op. Working as a beekeeper has not only sparked my interest in bees but also a passion for insects in general! I have continued to study pollinators and insects of many species in South Africa and here in Boston. Why do you think it is important to keep bees or do the work you’re doing? Most are aware that keeping bees plays a huge role in providing humans with the pollination services required to grow most of our food. But, many who keep bees do so in such a way that is detrimental to the health of honeybees. It is so, so important for people to keep bees and do it right. Bees need a permanent home in which they can become well established and locate a diverse selection of resources. Backyard beekeepers are the greatest asset to extending pollinator coverage in a way that is also beneficial for the bees. Do you have any of your own hives or family with hives? I am so excited because I will be setting up two hives in the spring on my parents property. They have the most beautiful bee-friendly garden! They will be the first hives I have taken care of off-the-clock, apart from occasionally helping a friend. What is your favorite cool bee fact? When a colony replaces a lost queen on their own, they raise several eggs just to be sure one makes it. When the first queen hatches, she makes a piping sound called “tooting”, which is followed by a response piping call from all queens that have yet to hatch, called “quacking”. This informs the newly hatched queen of the location of her unborn sisters, so that she can locate and destroy the larvae before they hatch. Though it seems brutal, this is actually a beautifully selfless act. The unborn queens sacrifice themselves to avoid a fight between two hatched queens, that can often damage or kill both. Honeybees are eusocial, and most individuals give up their fertility and sometimes their lives to support a single queen – all for the sake of the family. Honesty time: are you afraid of bees? Honeybees are not to be underestimated, that’s for sure. But most of the time, if you stay calm and slow, the bees would much rather think about flowers than be bothered by you. I act tough but as soon as a bee bonks me in the head I run! Would you rather be a queen bee or a worker bee? Definitely a worker bee! Although they live much shorter lives they have so much more fun exploring every day! Have you ever dated another beekeeper? Nope! 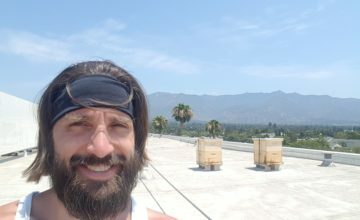 Favorite beekeeping location? There’s nothing like beekeeping on the coast! I love going to Martha’s Vineyard and along the coast of Maine, where I grew up. What is your advice for young people interested in beekeeping who may not have the space or money to start keeping bees on their own? There are so many friendly and awesome people who keep bees all over the place. It’s never hard to locate a beekeeping community near you. Beekeeper associations can be awesome resources for people looking to study up before they can actually get a hive themselves. You can also attract feral bees in your area by planting flowers. You’ll get to see lots of different species this way, too.